Which Users Need a License? How Do I Update My Billing Details or credit card information? How Do I View My Invoice? How Do I Assign the RIO Inventory Licenses? Why Can I Still View Batch Information After I Have Disabled Batch Control? Why Cant I Use Backorder for Serial Products? Why Can’t I add Products to an Opportunity? Can RIO Inventory Work Only on Certain Record Type? What is the Allow Backorders Flag in Opportunity? What Happens When an Opportunity Stage Changes? What Happens When a Product is Removed from an Opportunity? Can I Specify a Different Low Inventory Threshold for a Specific Product? Can I Specify a Different Opportunity Probability %age? What is the Opportunity – Probability (%)? What is the Low Inventory Threshold? What do the Product Inventory Status Flags Mean? How Do I Clone a Product? Do you have a Partner Referral Program? Batch and Serial Product control is a feature that is enabled in the RIO Inventory Configuration Tab. By enabling this feature in the RIO Inventory Configuration, it allows Products to be marked as a Batch or Serial type Product. This field is configurable under Product Records. When a Batch/Serial product is added to an Opportunity, it will automatically assign from the Warehouse Inventories that best match the Assignment method. If the best-matching Warehouse Inventory doesn’t have enough available quantity, it will assign as much as it can from that Warehouse Inventory, and then start to assign from the next best-matching Warehouse Inventory. This continues until all the products are assigned. Note: This assignment will only assign from Warehouse Inventories at the Default Location. You can still manually choose to assign from the other Warehouse Locations. First In, First Out – Searches for the Warehouse Inventory with the earliest Created Date. Earliest Expiry Date – Searches for the Warehouse Inventory with the earliest Expiry Date. Smallest Batch Size – Searches for the Warehouse Inventory with the smallest Quantity Available. 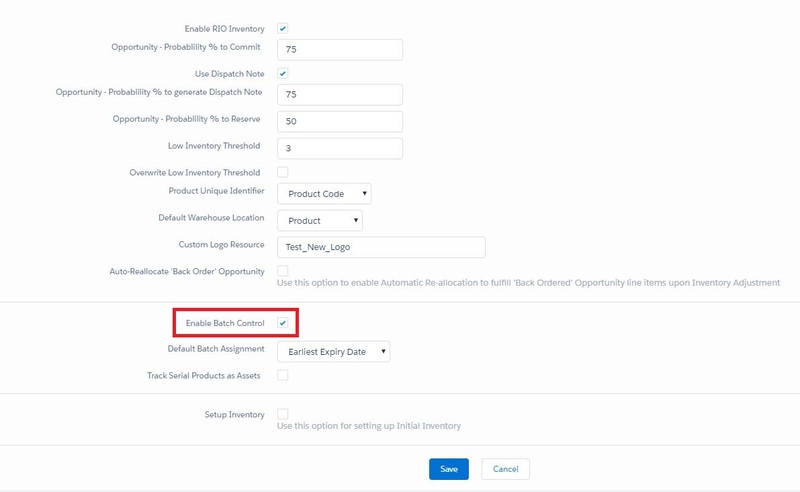 Note: The Opportunity Product Assignment will only assign from Warehouse Inventories at the Default Location. You can still manually choose to assign from the other Warehouse Locations. When adding Batch, Serial, Batched-Serial Products, it allows specification of Batch, Serial, Batched-Serial information for the Product. Batch – Batch type products come in batches with a Batch Number. These products can be automatically assigned to Opportunities based on their Batch information, similar to how normal Warehouse Inventory is assigned by Default Location. Serial – Similar to Batch products, but they use a Serial Number instead, and there can only be 1 Warehouse Inventory for each Serial Number. Batched-Serial – Each Serial-Numbered Product will be associated with a Batch Number. There can only be 1 Warehouse Inventory for each Batched-Serial Number. Batch Assignment Method – Depending on selected Method, will determine which Warehouse Inventory is selected from. The Default Batch Assignment Method in the RIO Inventory Configuration. (Note: “Enable Batch Control” must be checked before this field to appear). Default Batch Assignment set under RIO Inventory Configuration will be used if Batch Assignment Method is not specified under Product. The Batch or Serial related settings under RIO Inventory Configuration and Product is explained below. Quantities can be adjusted to the Batch, Batched-Serial or Serial Product using Inventory Adjustment. Refer to the Inventory Adjustment page for full details.